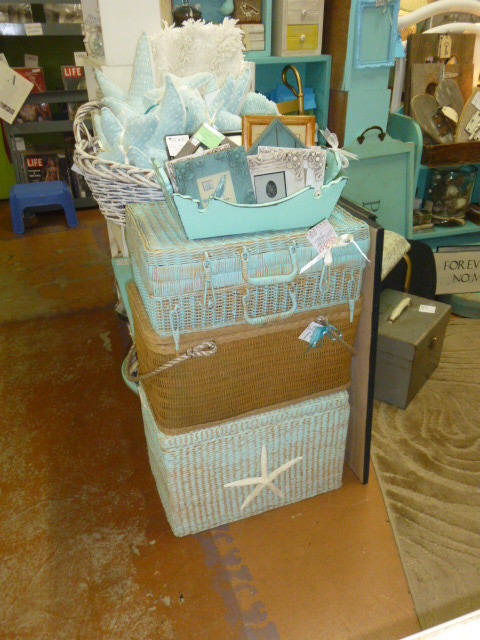 The middle basket in this stack had been in my booth at Stars for some time. It was time to bring it home for a make over. 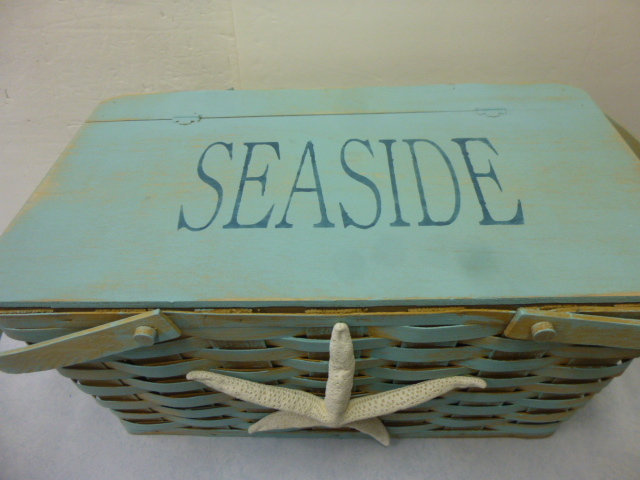 Since the sea grass trunk on the bottom had sold so quickly, I decided to ‘beach-ify’ this one too. Since i had put a white fingerling starfish on this one that was still in my booth at Stars, I decided to do something different on this next one. 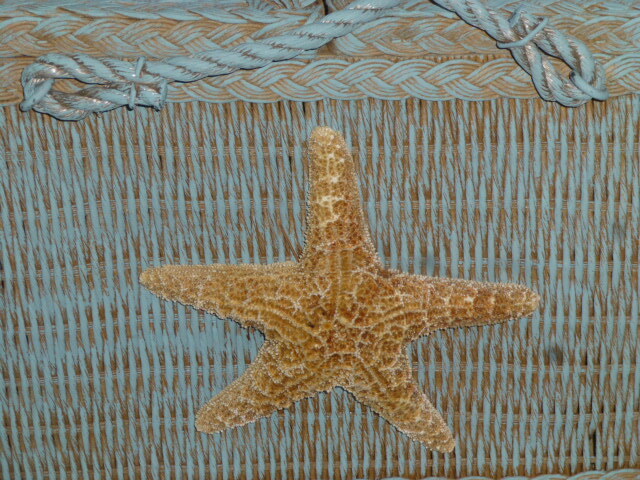 So I did a sugar starfish on this one, AFTER I dry brush painted it s slightly darker shade of turquoise. 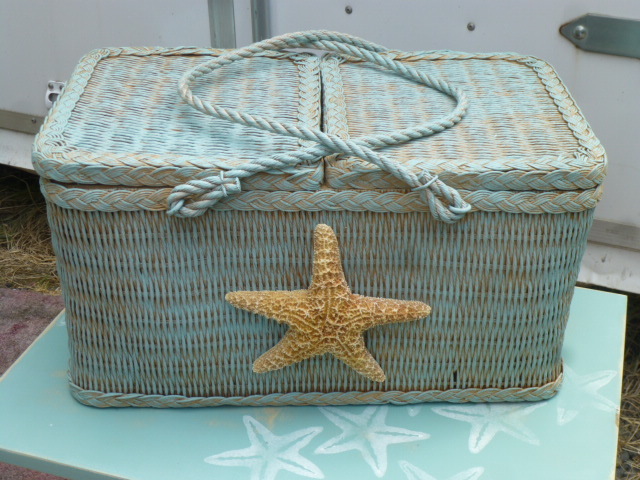 The hardest part was finding a starfish FLAT enough to adhere to the wicker. I used e600, and weighted it down with a heavy box while the adhesive cured. Ready to go to Stars. It stacks nicely with the other two baskets. 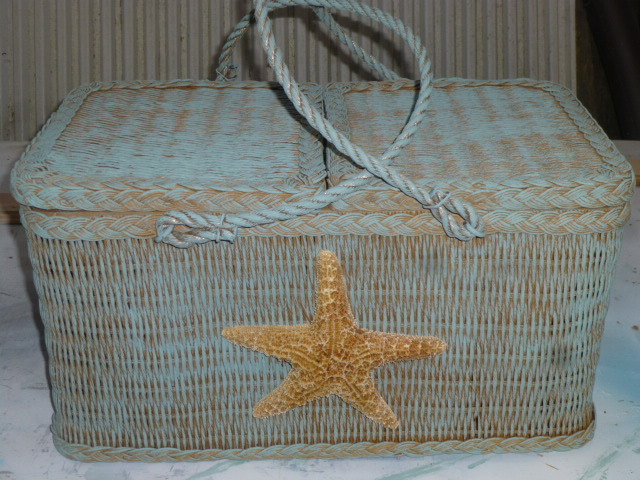 Love all your starfish baskets!!! I love your blog and have read it for awhile now. 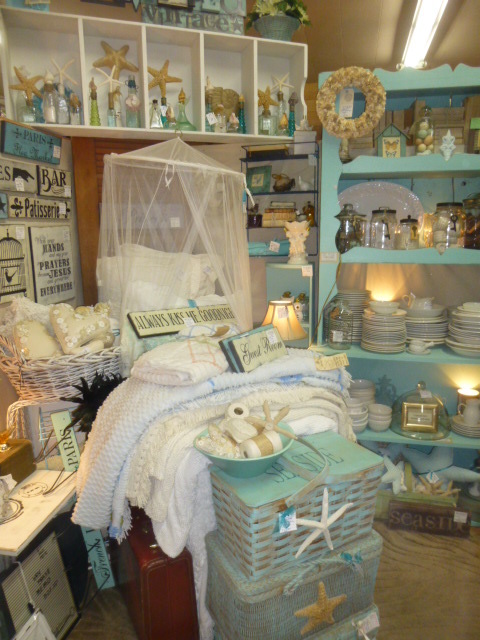 I know you love the blue turqouise color,for your projects. Do you ever get inspired to choose a different color? For instance: red, brown, neon pink (lol). I am a big fan of yours. You are so talented, also love your dollar diva blog. Yes I DO get inspired to try different colors, and I have TRIED different colors over the years. NONE of them consistently sell as well for me as my ‘beachy blue color’. Not even WHITE or black! I usually add a bot more white stuff in the spring and black furniture in the fall, and a few pieces sell, but I usually end up repainting them the blue!! Greetings from SoCal! I have been following you for quite a long time and you are my inspiration! I miss your posts lately and hope you are doing OK! I absolutely love how you did the picnic basket! Since I am pretty sure it’s unavailable would you mind giving me tips on how you painted it? Type of paint etc? I want to attempt this! I love your site! I always ONLY use water based acrylic or latex paint. For the basket I used a ‘dry brush’ painting technique. You can do a search of my blog for more info on how to dry brush paint. 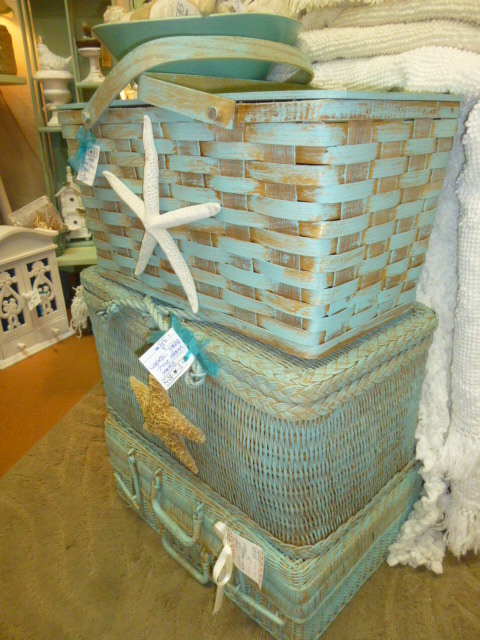 I love this idea to give my old boring Longaberger baskets some new life.